Covington is located at 32°10′37″N, 97°15′26″W (32.176850, -97.257104). According to the United States Census Bureau, the city has a total area of 0.8 square miles (2.1 km²), all of it land. As of the census of 2000, there were 282 people, 111 households, and 79 families residing in the city. The population density was 339.8 people per square mile (131.2/km²). There were 122 housing units at an average density of 147.0/sq mi (56.8/km²). The racial makeup of the city was 90.78% White, 3.19% African American, 0.35% Native American, 2.84% from other races, and 2.84% from two or more races. Hispanic or Latino of any race were 6.38% of the population. There were 111 households out of which 31.5% had children under the age of 18 living with them, 55.0% were married couples living together, 9.9% had a female householder with no husband present, and 28.8% were non-families. 22.5% of all households were made up of individuals and 9.9% had someone living alone who was 65 years of age or older. The average household size was 2.54 and the average family size was 2.99. In the city the population was spread out with 27.0% under the age of 18, 10.3% from 18 to 24, 26.2% from 25 to 44, 24.1% from 45 to 64, and 12.4% who were 65 years of age or older. The median age was 35 years. For every 100 females there were 86.8 males. For every 100 females age 18 and over, there were 94.3 males. The median income for a household in the city was $38,214, and the median income for a family was $45,179. Males had a median income of $35,972 versus $23,750 for females. The per capita income for the city was $18,874. About 13.9% of families and 9.6% of the population were below the poverty line, including 4.4% of those under the age of eighteen and 23.4% of those sixty five or over. 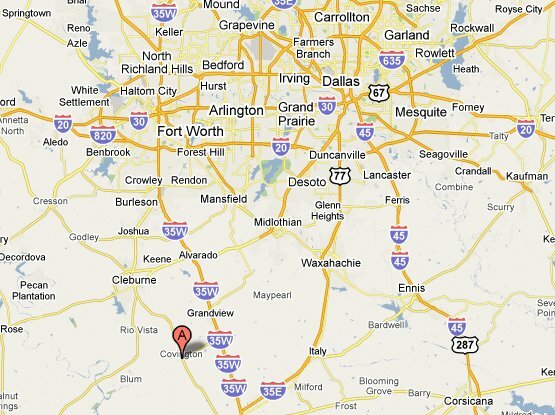 Covington is on State Highway 171 twelve miles north of Hillsboro in north central Hill County. The community originated through the efforts of James J. Gathings, who moved to Texas from Mississippi in 1852 and purchased thousands of acres of land near what is now the Covington townsite. He established a large and successful farming and ranching concern, initially based on slave labor, and set aside 100 acres of his ranch for a town, which he named for his wife, Martha Wall (Covington). Lots were offered free to families who would establish homes, build a school, and prohibit the manufacture and sale of alcoholic beverages. Gathings's generosity was due in part to his desire to open a retail center for his other business, a factory that produced saddles, boots, wagons, flour, clothes, and almost any other item needed by settlers. A steam mill and gin provided farmers with a further incentive to make Covington their place of business, and the community became their retail point. Gathings himself became postmaster of the community when its first post office opened in 1855. To attract more families to Covington, he and his brother Philip established Gathings College in the early 1860s. The school operated till 1885, at one time enrolling 200 students. By 1870 Covington had a population of nearly 500. The town suffered its first setback when the Missouri, Kansas and Texas Railroad bypassed it. In 1904, however, the tracks of the Trinity and Brazos Valley Railway reached the community. For the next three decades Covington served area farmers and ranchers as a shipping and retail center. The Great Depression, however, ended its period of sustained growth. During the 1930s the Trinity and Brazos no longer stopped in Covington. In addition, World War II, the growth of Waco and the Dallas-Fort Worth area, and the construction of state and federal highways combined to end Covington's growth. Beginning in 1945 its population began a steady decline, from 450 to 270 by the late 1980s. The community reported only one business in 1988. In 1990 the population was 238, and in 2000 it was 282.